I had a small bottle of sparkling apple cider in my cupboard leftover from the holidays. A quick google search lead me to this highly rated recipe. It was rich and moist yet still light. If you’re looking for an easy desert, try this out. Have you ever wondered about the origin of pound cakes? 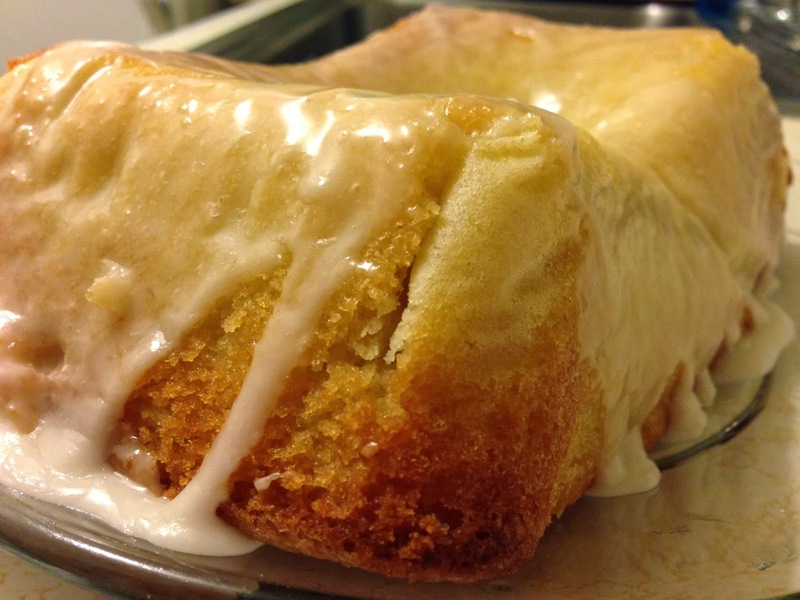 At first a pound cake had a pound of flour, eggs, butter, and sugar each. That’s a big cake! The ingredients are ¾ cup softened butter, 1 ½ cups sugar, 3 eggs, 1 ½ cups all-purpose flour, ¼ teaspoon baking powder, ¼ teaspoon salt, and ½ cup sparkling apple cider. The glaze requires ¾ cup powdered sugar and 3 to 4 tablespoons sparkling apple cider. I began by creaming the butter and sugar together. I added the eggs one at a time and mixed after each addition. In another bowl, I whisked together the flour, baking powder, and salt. I alternated adding a part of the flour mixture and apple cider into the creamed butter. I stirred after each addition. I began and ended with the flour mixture. I poured the batter into a parchment lined and buttered loaf pan. I baked the cake for 45 minutes in a over preheated to 350 degrees. I always undercook my loaf cakes and breads. This is not recommended! It makes a gooey mess in the middle of the cake. I have a glass pan, which requires a little more time. Even though I know this, I repeatedly undercook things when I use this pan. I should have cooked it for another 10 minutes. 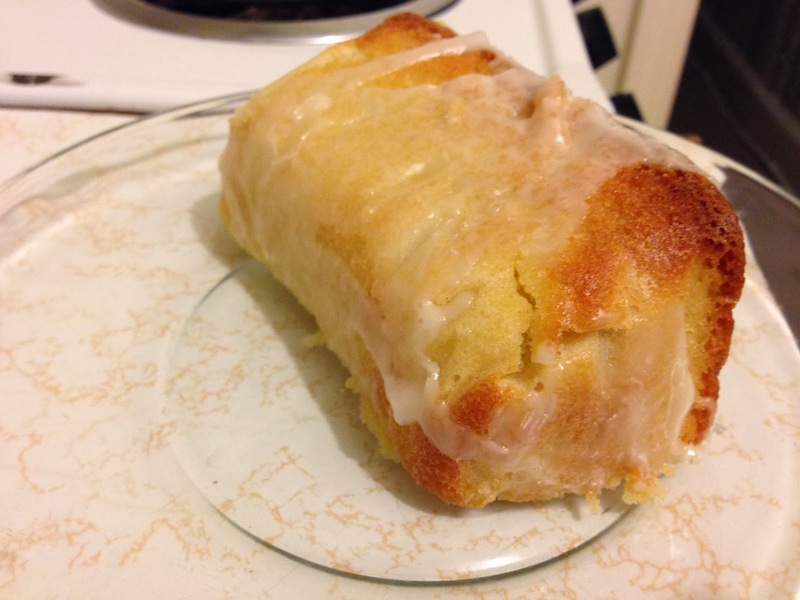 After the cake had cooled, I prepared the glaze by combining the powdered sugar and sparkling apple cider. 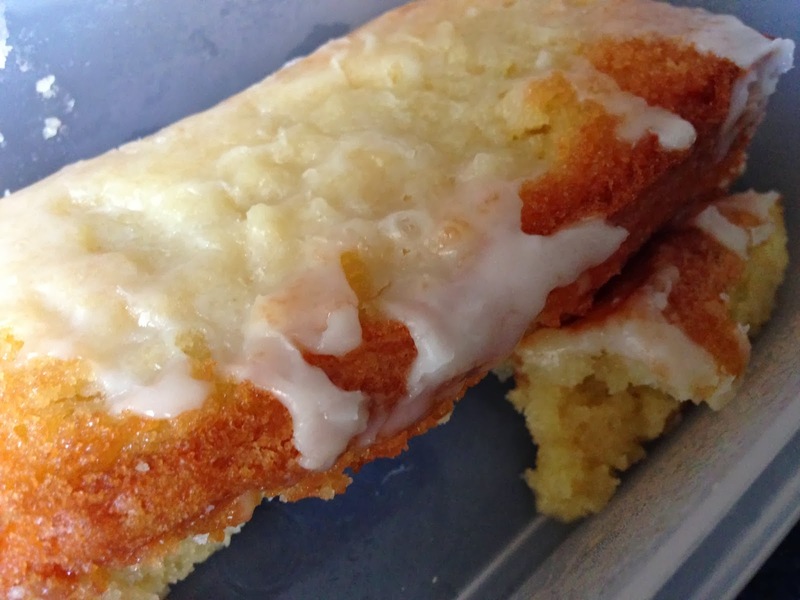 I added the cider gradually because it is very easy to make a very runny glaze. 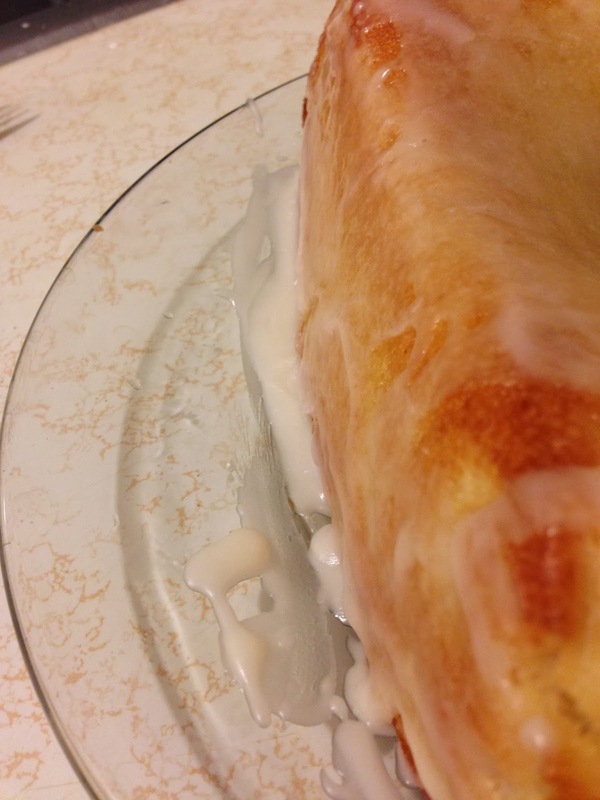 I pored the glaze over the cake. This was rich and tasty. I was surprised how little I could taste the apple cider. It is very subtle. I wouldn’t have guessed it was an ingredient if I hadn’t added it myself. Don’t make this expecting a strong apple flavor. I tried to use fancy angles to hide the fact that my cake sunk. It sunk because it was under baked. It sounds amazing!! I love sparkling cider.